The German media had a lot to say about President Trump’s announcement. None of it was positive. Two weeks ago, U.S. President Donald Trump announced that America recognizes Jerusalem as Israel’s capital. The United Nations Security Council responded by making a resolution that would have required him to rescind that declaration. On Monday, the U.S. vetoed that resolution. There is deep division over this issue of Jerusalem. That city is the capital of Israel. It has been right at the heart of the Jews’ presence in that area for 3,000 years. Every country has its embassy in the other country’s capital, but they are afraid to do that in Jerusalem. The last four American presidents have promised that they would move the American Embassy from Tel Aviv to Jerusalem because that is irrefutably the capital. But they never followed through on that promise because they were intimidated by the Arabs. However, President Trump moved forward on that promise. He didn’t let the Arabs or anyone else intimidate him. He may have to pay a price for that. Across the world, probably the most common response to his announcement was that it proved America can no longer be the mediator of the Arab-Jew peace process. They said that recognizing Israel’s capital in Jerusalem betrays a bias against the Palestinians—even though Israel’s hold on West Jerusalem has never been a point of debate. Only Arab leaders who say Israel shouldn’t exist at all dispute the Jews’ claim over the area where the U.S. plans to move its embassy! Other nations now say the United States cannot mediate in the Middle East. Europeans are putting themselves forward as the natural replacement. This is exactly what Bible prophecy foretold. And Bible prophecy also tells us the horrifying outcome of Europe getting involved! 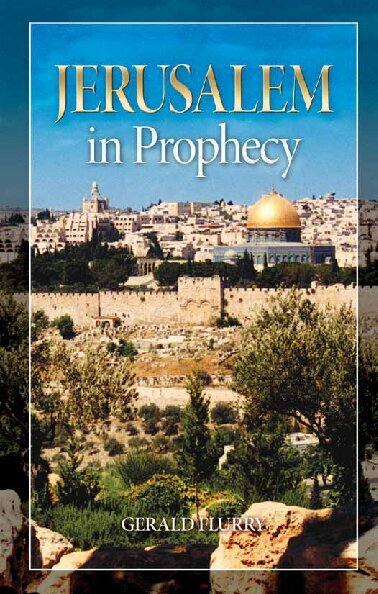 You can read all about this in my free booklet Jerusalem in Prophecy. The German media had a lot to say about President Trump’s announcement. “Donald Trump has made a historic mistake,” wrote Der Spiegel. “Peace in the Middle East cannot be achieved by one side dictating the conditions” (December 15). Their general view is that the Jews are occupiers and the Palestinians are victims. Is that an unbiased view? Anyone who thinks that Germany and Europe would be an impartial mediator in this conflict needs to see reality. There is a strong swell of hatred for the Jews in Europe. Reports of anti-Semitism rising in Germany are routine. On the weekend of President Trump’s announcement, thousands of people demonstrated in Berlin. Polls show a lot of hatred for Jews growing in that nation today. We see that in their stance on Jerusalem. In an article titled “Jerusalem Dispute: EU Rejects Netanyahu,” Spiegel Online reported, “Benjamin Netanyahu demands that Europeans recognize Jerusalem as Israel’s capital, but EU foreign ministers are giving the premier in Brussels a cool reception” (December 11). 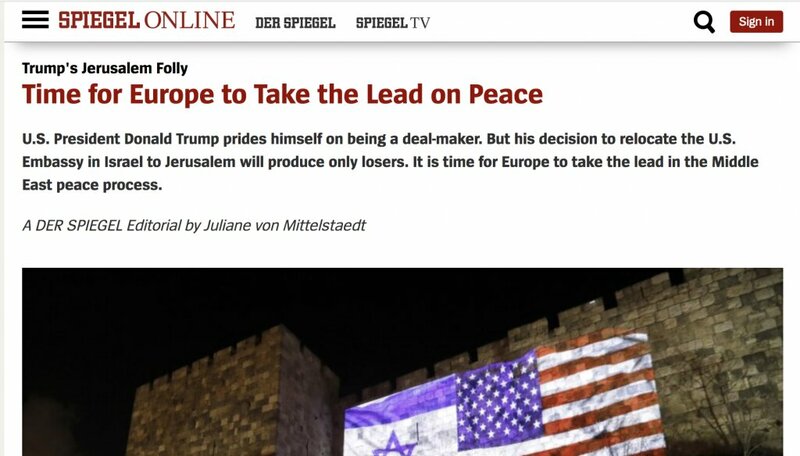 German’s Spiegel left no doubts as to what it thinks about Jerusalem being Israel’s capital. In response to that statement, Spiegel Online quoted a professor of history and culture of ancient Judaism and Christianity saying, “I do not know which edition of the Bible Mr. Netanyahu owns.” This scholar could hardly have made a more ignorant statement! Has he ever even looked at the Bible? Spiegel went on to say, “Even among Israelite researchers, it is controversial whether David was the king of an empire with temples and palaces or ruled as a clan chief over a few mud-huts. Furthermore, 3,000 years ago there was no Jewish people in the present sense.” That is abysmally wrong! There is abundant archaeological and historical evidence to prove that the Bible’s account of King David is accurate! What Netanyahu said is true! But sadly, nobody believes the Bible. The hostility against the Bible and the hostility toward the Jews and their presence in Jerusalem are closely related. And they come from fundamentally the same source. The announcement by the Trump administration regarding Jerusalem could hasten that violence. We need to be watching closely for the fulfillment of these urgent end-time prophecies. Israel is in a precarious position. A shift away from America and toward Europe as a peace broker is not going to make it more secure. It actually signals the coming of the fall of the Jewish state! The Jews should never place their trust in other nations for their own protection—especially the very people that perpetrated the Holocaust in recent history! Watch this contention over Jerusalem closely. If you understand Bible prophecy, you know that what happens in that city is the strongest sign of just how close is the coming of the Messiah!